THE TERRA-COTTA WARRIORS AND HORSES: Also known as the Museum of Emperor Qin Shihuang's Terra-cotta Warriors and Horses, this is one of the greatest archeological discoveries in the world. 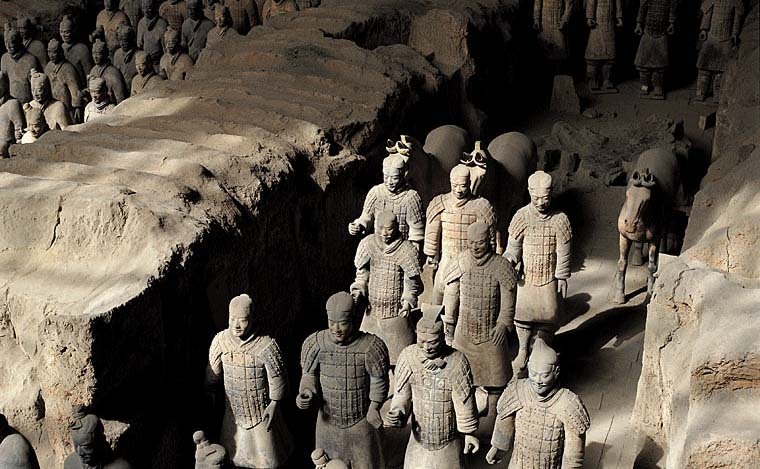 Three exhibition halls, the largest of which is 600 feet by 200 feet, house the continuing excavation of an army of 6,000 life size terra-cotta soldiers and horses that guard the tomb of Qin Shihuang (259 BC-210 BC), the first emperor of a unified China. It is a stunning exhibit of ancient artifacts that is well laid-out and easy to view. Listed as the World Cultural Heritage Site by UNESCO of the United Nations in 1987. The Terracotta Army are the Terracotta Warriors and Horses of Qin Shi Huang the First Emperor of China. The terracotta figures, dating from 210 BC, were discovered in 1974 by several local farmers near Xi'an, Shaanxi province, China near the Mausouleum of the First Qin Emperor . The figures vary in height (183–195cm - 6ft–6ft 5in), according to their role, the tallest being the Generals. The figures include warriors, chariots, horses, officials, acrobats, strongmen, and musicians.